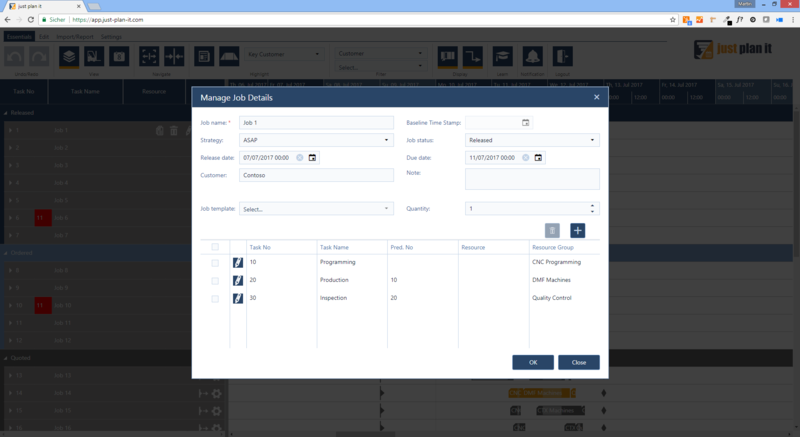 just plan it is a ready-to-use manufacturing planning software for job shops and small make-to-order companies providing an easy time and resource scheduling. just plan it empowers SMB make-to-order companies and job shops to increase delivery time commitments. 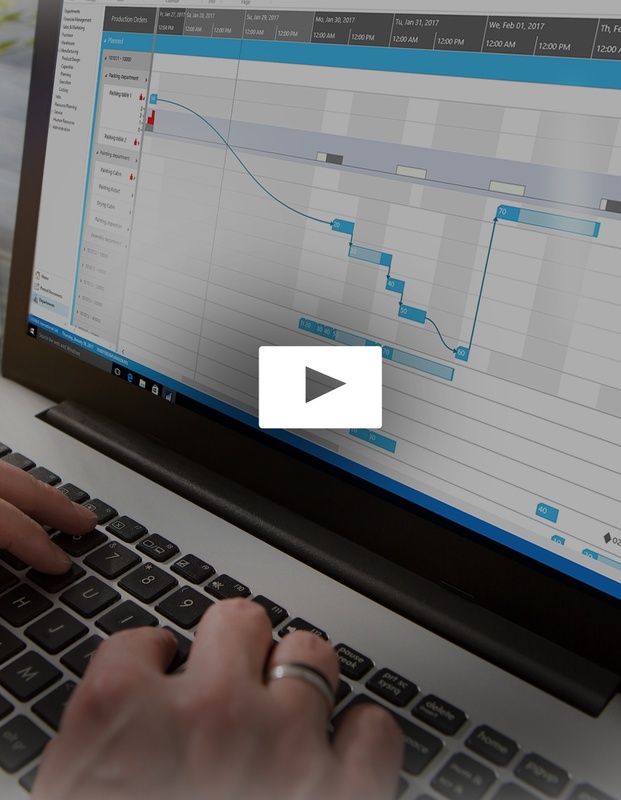 It is a visual scheduling application built for production planers and owners of small businesses allowing easy-to-understand drag & drop changes of the schedule. It is built with our NWAF technology and a ready-to-use web-based application running in the cloud. Start Managing Your Schedule. Now. Take 60 seconds to learn what just plan it is all about. 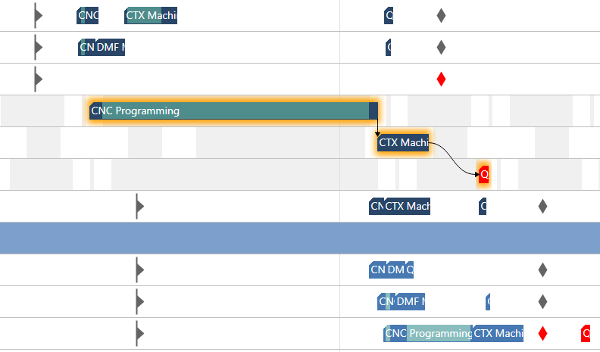 Other than many other production planning applications, just plan it does not treat visualization as a "nice to have". Our mantra is "visualization first" and this makes just plan it easy to understand and enables every user achieving remarkable results fast. just plan it achieves making the first step from homegrown Excel scheduling or whiteboard-based manual scheduling to using a comprehensive software. Hence, it seamlessly integrates with Microsoft Excel and you upload your Excel schedule with really a few clicks. Our job shop scheduling software runs in the cloud. That means you can access it through a web browser and don't need to install any software. Also, you do not need own IT guys to maintain it. This is all done by us as part of the service. 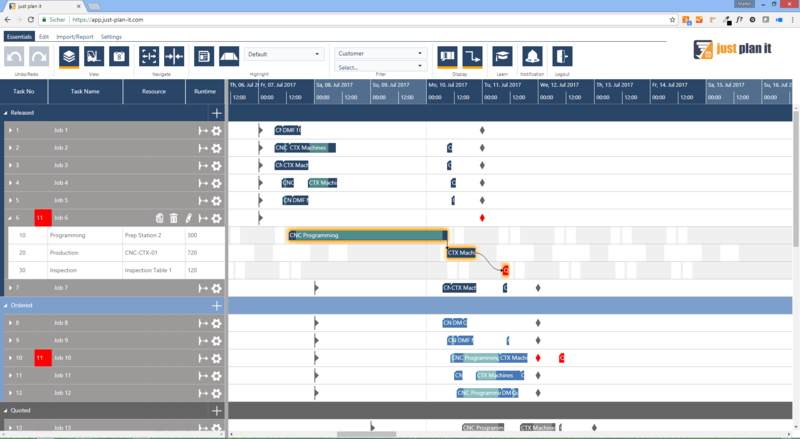 just plan it follows the idea of proving a fully visual scheduling experience. 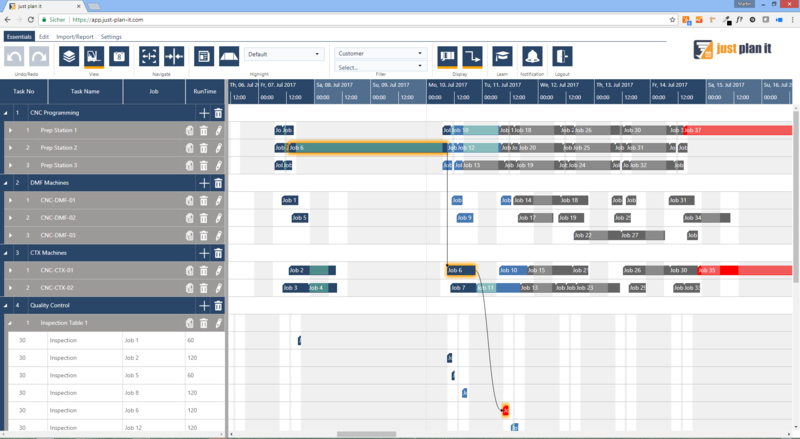 Jobs and tasks are shown as bars, work and non-work times are shown as grey/white pattern in the background and release/due dates are represented as symbols. Red due dates and red task bars indicate late jobs. Thanks to the 100% visual approach, planners quickly understand the schedule, issues and dependencies and can take corrective actions fast. 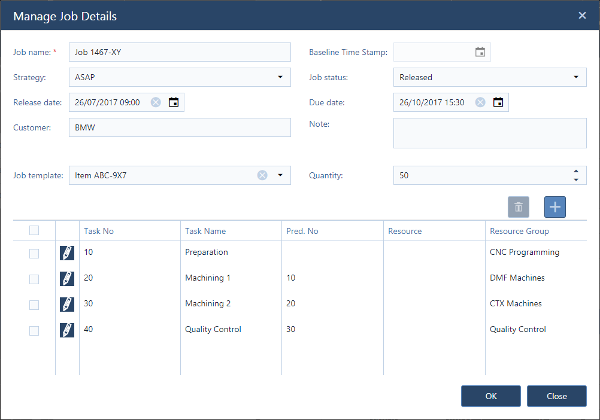 Move the position of jobs, tasks and due/release dates by simple mouse actions – horizontally in the Job View to modify start and end dates or vertically in the Resource View to reassign a task from one resource to another. With any movement of a task and/or a date, you immediately see the impact on this job ... and on all the other jobs in your schedule. Hence, you are not just "moving around bars", but you always get at-the-glance-feedback about what this particular change would mean to the rest of your schedule. Of course, you can undo any drag & drop change you make. With just plan it, you can apply different scheduling strategies such as as soon as possible (ASAP) and just in time (JIT) for your entire schedule. However, there might be situations in which you want to make exceptions from this general rule and e.g. plan one job JIT although the rest of your schedule is planned ASAP. This can be done by one mouseclick as you can see in the animated picture at the right hand side: the job is switched from ASAP to JIT and back to ASAP again. Nice 'n easy. Colors are to software applications what spices are to meals: they truly can make the difference. At just plan it, we have a standard color scheme to help you see late jobs at a glance, and also quickly see if a job is released, ordered or just quoted. However, we sense that it might be useful to also stress out other facets in your schedule: jobs for your key customers, jobs that require a certain tool, jobs with waiting times that run late, e.g. For that purpose you can define as many color schemes that you like and apply them with one click. The screenshot at left shows finished tasks (black), started tasks (green) and tasks that had been paused (red). Have jobs that repeat? Have jobs that follow certain routings? Have jobs for which you know the routing and the production time per unit? Do not want to manually create each of these jobs? Good news is that just plan it allows you to create job templates and then to add a job to the schedule by just picking the respective template, and adding the units to produce as well as (if you like) information such as release date, due date or customer name. 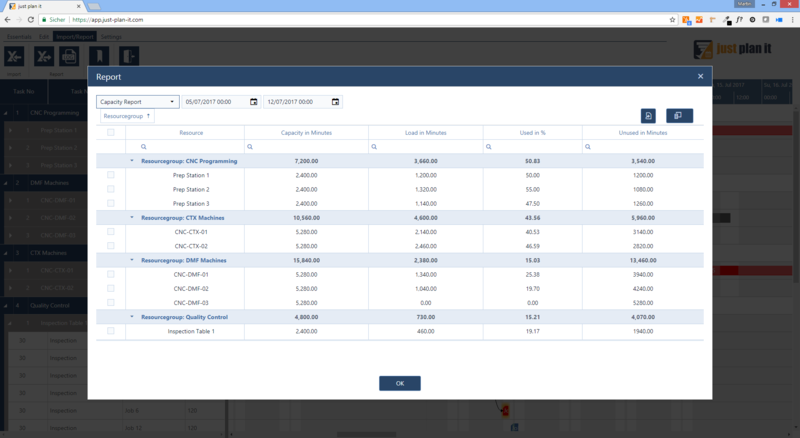 Not sure if an easy time and resource scheduling software is what you need? Here is some info to take a deeper dive. This 16-pages whitepaper is not specific to any particular software. 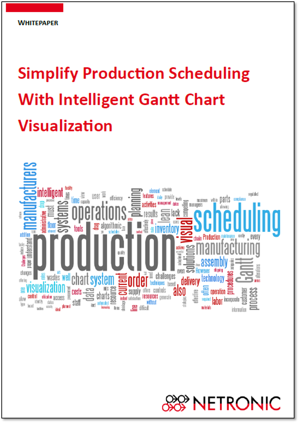 It just deals with the question how production scheduling can be simplified by using an intelligent Gantt chart visualization. We love webinars and hence we run them frequently (typically every 3-4 weeks). We make sure the we find a great rhythm between beginner, advanced and pro level webinars so that you should find a suitable one in due course. Start your 30 days trial. Any other question? Just let us know and we are happy to help.